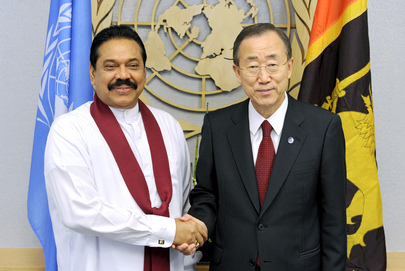 UNITED NATIONS, February 22 -- Two months after UN Secretary General Ban Ki-moon claimed that his Panel on Sri Lanka could visit the country due to President Mahinda Rajapaksa's “flexibility,” on February 23 Ban is set to meet in New York with Sri Lankan Attorney General Mohan Peiris and Secretary for External Affairs C.R. Jayasinghe, Inner City Press learned late on February 22. Ban's Panel has not traveled to Sri Lanka, even as its extended deadline approaches. Inner City Press has reported exclusively that the Rajapaksa government since Ban's December 17 statement has refused to allow Ban's three person Panel to interview any Sri Lankan official, saying that such officials will only speak with Ban's Executive Office of the Secretary General. Even Ban's offers of video conference between his and Rajapaksa's Panel, or written questions, were rejected. While many, including in Ban's office, feels this totally undermines the Panel on Accountability that Ban set up, they say apparently Ban has given in, as reflected by Wednesday's meeting. We'll see. Inner City Press: I wanted to ask you a non-Libya question. Spokesperson Nesirky: By all means. Make a change. Spokesperson Nesirky: Start again, please. Inner City Press: Yeah, there was a filing with the Prosecutor of the ICC that has been widely reported in the Australian media. It’s largely against the [Permanent Representative] of Sri Lanka, saying that he should be prosecuted. But it has a couple of paragraphs, one which says there is a basis to question whether Vijay Nambiar was in fact an innocent neutral intermediary. And then it has a factual, a paragraph that it says is facts, saying that Nambiar, through the UN’s 24-hour dispatch, told Colvin that Mahinda Rajapakse, Gotabaya Rajapakse and Palitha Kohona had assured Nambiar that the LTTE [Liberation Tigers of Tamil Eelam] members who surrendered would be treated like normal prisoners of war if they hoisted a white flag high. I wanted to know what the UN’s response to this now, why the reported filing? Is that an accurate statement of fact and what’s the UN’s response to the characterization? Spokesperson Nesirky: Well, first of all, the filing is as reported in the newspaper. Inner City Press: : No, no, the file; I can give you a copy of the filing if you want it, it’s public, it’s been made public by two Tamil organizations that filed it with [Luis Moreno] Ocampo’s Office. It was picked up in Australia, I guess because of the Kohona angle, but I just want to know, since Mr. Nambiar is the Chief of Staff of the UN, what is the response to the characterization of him as possibly involved and the factual statement of him conveying these assurances from the President of Sri Lanka? Spokesperson Nesirky: Well, a couple of points. The second is that I think you would need to check with the International Criminal Court’s Prosecutor about something that has been filed to the ICC Prosecutor. I think you would need to look at that. Secondly, on the second part of your question, I really don’t have any comment on that at this time. Okay? Spokesperson: I said I don’t have any comment on it at this time. Okay, all right, thank you very much. In what the UN called “inaudible,” Inner City Press asked Nesirky if he was even going to try to get a comment or response from Mr. Nambiar. Now -- will Nambiar be at the February 23 meeting? Watch this site. With UN Panel Blocked from Sri Lanka, Ban Says “There Was An Agreement"
But not only have seven weeks gone by since Ban praised President Mahinda Rajapaksa for his “flexibility” and announced his Panel on Accountability would go -- since then, a range of UN officials have acknowledged that Sri Lana has now refused to let the UN Panel go and speak with Rajapaksa's Lessons Learnt & Reconciliation Commission. Inner City Press has it from both sides that the UN is now offering a mere video conference call or even answers to written questions. So much for the agreement. Left unanswered, still, is with whom the stated agreement was. Inner City Press: Sri Lanka – I need to ask you this. In both of your two last monthly press conferences, you said that your Panel was going to travel to the country, you praised President Rajapaksa’s flexibility. It now appears, and I’ve now heard from people on both sides that the Panel is probably not going to go, that they’ve offered a video conference. I just wondered what happened. Who did you speak with before you said that they could go and how do you read this now, with their failure to go, as the deadline approaches? SG Ban: I can tell you that there was an agreement and that my Panel will visit Sri Lanka and they are still discussing about the format and their role in Sri Lanka. And whenever it is decided, I will let you know. SG Ban: I didn’t say that they [wouldn’t] go. SG Ban: They will try to go anyway. UNITED NATIONS, February 7 -- “I visited Sri Lanka twice” UN Secretary General Ban Ki-moon said on February 2 at Oxford, answered a question about the UN failing to protect Tamils and failing to pursue accountability for those who ordered them killed. Inner City Press had covered Ban's May 2009 trip to Sri Lanka, but was unaware of any other trip Ban made to the country since he became UN Secretary General. So for five days Inner City Press has asked Ban's spokesperson Martin Nesirky for the date of the second trip, without response. On February 7 at the day's UN press briefing, Inner City Press asked Nesirky if Ban might paradoxically have been referring to a trip he made in 2005, when he did not yet work for the UN but was South Korea's foreign minister. The question still remains, what was accomplished for accountability during that trip? Some in fact tie that 2005 trip, which included a detour to President Mahinda Rajapaksa's Southern hometown of Hambantota where late a Chinese port was built with South Korea involvement, with Rajapaksa convincing Sri Lanka's candidate for Secretary General to withdraw in favor of Ban. Lee Hae-chan, Prime Minister of the Republic of Korea will be in Sri Lanka today and tomorrow... The Prime Minister will be accompanied by a high level delegation including Ban Ki-moon, Minister of Foreign Affairs and Trade, Kang Dong-suk, Minister of Construction and Transportation and Cho Young-taek, Vice Minister for Public Policy Co-ordination in Prime Minister's Office... The relief supplies will be later distributed by the Korean NGOs operating in Sri Lanka. Together with Prime Minister Rajapakse, Prime Minister Hae-chan will travel along the western coast to have a first-hand view of the destruction to lives, livelihoods and property and will make a stop-over in Hambantota. How is referring to this trip an answer to this question, asked at Oxford? Q: The UN has failed to protect and prevent in such countries as Sri Lanka, where over 40,000 innocent civilians were massacred in 2009. Will you ensure, during your term, that those responsible are brought to justice? Will you ensure there is a proper investigation of war crime? I visited Sri Lanka twice and I had very serious talks with the President and Government leaders. After a lengthy, very difficult, almost turbulent course of negotiations, I was able to convince the Sri Lankan Government that a group of experts would be established. Still, it has not yet been able to complete its mission. They are still negotiating with the Sri Lankan Government. Inner City Press on February 7 asked Ban's spokesman to confirm or deny that the UN is now offering Sri Lanka a mere video conference call or even just written questions, rather than a visit. The discussions continue, Nesirky said, repeating that a visit to Sri Lanka is “not essential.” Nesirky's Deputy Farhan Haq said that a visit to Sri Lanka is “desirable.” So what is a video conference, or written questions? Watch this site.